Tender Pumpkin Coconut Muffins have the aroma of fall, sweater-weather and cool mornings. 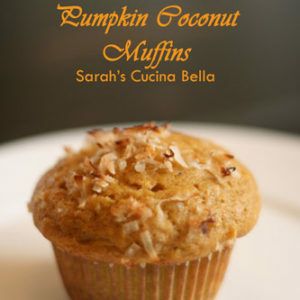 The rich combination of coconut and pumpkin are lightly sweetened with brown sugar. When the weather gets like this, I crave warm, rich, heavier foods that keep you comfy even when the weather is not. 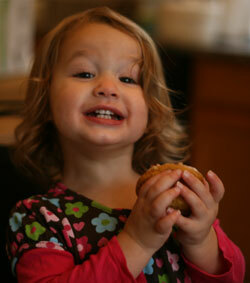 This muffin totally fits that bill. 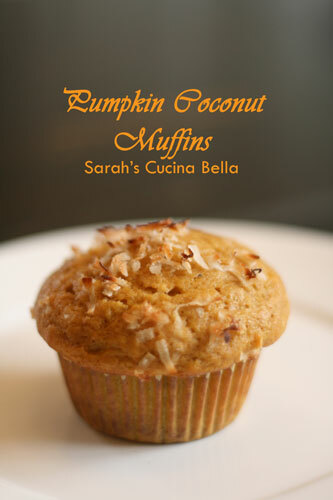 Pumpkin Coconut Muffins are a rich combination of coconut and pumpkin, two of my very favorite flavors. The brown sugar makes it pleasantly sweet, but not so sweet that you will have a sugar rush at 8 a.m. The recipe is pretty easy (as most muffins are) and I was able to whip these up on a Friday morning, without missing any deadlines to school drop-offs. No, I don’t have any magic elves to help out — just two sweet kids. Actually, I did happen upon a new method for having the kids help me cook while testing this recipe. In the past, they’ve always pulled chairs to the counter and stood on them, as I did when I was a child. But walking space is at a premium near our counter, so I have been trying something different: mixing up recipes at our kitchen table. That allows me the freedom to get and put away ingredients as needed, and I don’t have to worry about anyone tumbling from a chair or getting too close to a hot stove. It’s working for us, and the kids really seem to enjoy it (the cooking and the new method). Preheat the oven to 400 degrees. Line a muffin tin with 12 spots with muffin liners. In a separate bowl, whisk together the eggs, milk, sugar, pumpkin puree, oil and coconut extract. Pour the wet ingredients into the dry ingredients and stir until just incorporated. Divide the batter evenly between the 12 muffin liners. Don't be afraid to fill the cups to the top. Sprinkle the coconut flakes onto the top of all the muffins. Place the muffins in the preheated oven and cook until a toothpick inserted in the center comes out clean (15-20 minutes). Let cool before serving. YUM! The muffins look fabulous. I bet the coconut and pumpkin go really well together. Cute photo too! Mmm, yum, sounds like the perfect way to start the morning off right! Those sound delicious. I remember my mother doing the same type of thing (i.e. cooking on the table) so as to make it easier for me to jump in). I think it was also easier for her too, as I’ve since heard her complain a bit about the counter being a bit too high for her…. But at any rate, pumpkin muffins are a fav of mine, and fresh in the morning would certainly make me a bit happier to start the day! Wow! Those look fantastic, they’re on my baking list for this week. Maria, the pumpkin and the coconut do go really well together. I got the idea while I was cutting a slice of pie recently … so yum. Mangochild, cooking at the table really makes things easier. I just wish I’d discovered the technique sooner! Annie, thanks! I hope you love them as much as we did!